Vanities the Musical is about three dull cheerleaders who grow up into three dull middle-aged women. It presents a real head-scratcher: why would someone revive this extraordinarily dated and humongously naff musical? Set initially in mid 60s Texas, we meet three teenage girls changing into their cheerleader costumes. They are Joanne (Lizzy Connolly), Kathy (Ashleigh Gray) and Mary (Lauren Samuels). Bubbly and bitchy in equal measure, not even the Kennedy assassination distracts them from looking pretty and mooning over boys. 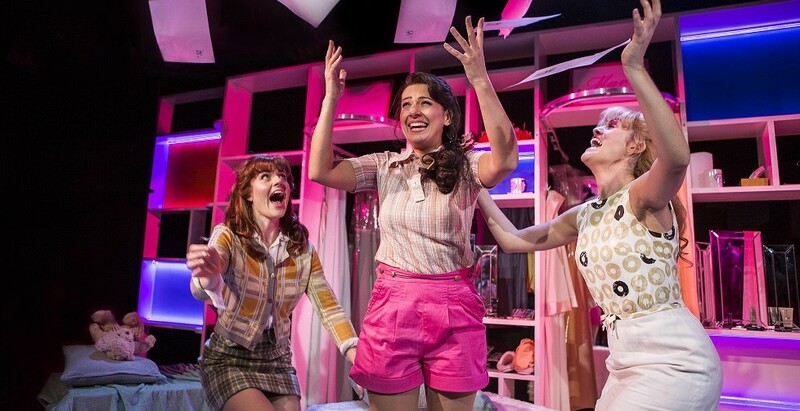 The rest of the play follows them through college, their twenties and finally concludes sometime in the 80s. As is expected from this sort of thing, the three start out best buds, their lives diverge and they find they don't have much in common, then they get older and realise they do: cue the hugs and pass the sickbag. First things first: the cast bear absolutely no responsibility for this shambles. All three actors approach this with steely-eyed musical theatre professionalism, giving their roles some welly and doing their best to mine every atom of humour from deeply unpromising soil. Lizzy Connolly is the funniest, taking advantage of a scene where her character gets drunk to work through some broad, though successful comedy. Similarly, set design and costuming is worthy of praise. You'd expect the characters in a show called Vanities to look good, and Andrew Riley's costumes and Richard Mawbey's wigs go a long way to capturing the aesthetics of the past. Similarly, Riley's set is a cleverly modular and malleable bit of design which allows for various backdrops and on-stage costume changes. All that said, you can polish a turd but it'll still be a turd. There's multiple levels of bad here, but let's start with the awful music. Sadly, the production must bear some responsibility for this - the plinky-plonky synthesised tunes sounding like the demo mode on a Casio keyboard. Then again, even if they were played by the London Philharmonic this would still be dreary as all hell. The style is elevator pop, a book formed of soppy sub-Bacharach ballads that go nowhere and are as emotionally moving as a Hallmark card. The nadir is Cute Boys with Short Haircuts, a test of audience endurance that goes on and on and on picking through crap lyrics like "The cute boys with short haircuts / In a maze of their own / And here I am a little lamb so lost and all alone". Cry me a fuuuuuucking river. The non-singy bits aren't much better. These are more archetypes than characters, never even approaching three dimensionality. Part of the problem is that the dramatic structure of periodic check ins with the characters over the years means we get to hear all about the semi-interesting things that've happened to the characters, but we never get to see them. It's a pretty egregious violation of the rule of 'show don't tell', and leaves us frustrated - if there's all this drama going on off-stage, why aren't we seeing it!? All of this is infused with an insipidly bland sentimentality. When the show began I figured that this cleancut All-American perkiness would soon be subverted and satirised, perhaps in a John Waters sort of style. It never comes close, settling for a vomit-inducing paean to the power of female friendship. Now, as we all know, friendship is indeed magic, but there's only so much of this syrupy crap I can take before I'm imagining reaching for a shotgun, sliding the cool barrel into my mouth, awkwardly hooking my toe around the trigger and Kurt Cobaining my brains over the wall. I couldn't get out of there fast enough. Vanities is the kind of show that leaves you chain-smoking and blankly staring into the dark waters of the Thames, pondering precisely what cancer lies at the heart of the human condition. I mean, sure the wigs were nice and it was funny when that one woman knocked her handbag over, but are people actually entertained by this nightmare? I mean... they clapped...? The skies darken. Apocalypse now. The horror! The horror! Vanities the Musical is at Trafalgar Studios until October 1st. Tickets here.